Please see Additional Info to learn more. Many cities and counties have laws preventing grocery stores and some other retail stores from handing out single-use plastic bags. Some of these laws require stores to charge for paper and reusable bags, and allow the stores to keep the money made from selling the bags. In 2014, a law was passed that would ban single-use plastic bags at grocery stores and some other retails stores across the state, but it has not gone into effect. Voters will decide if the ban should go into effect across the whole state when they vote on Prop 67, a different proposition on this ballot. If Prop 67 passes, stores would also be required to charge 10 cents for other types of carry-out bags made of paper, or thicker, reusable plastic. Under Prop 67, stores would get to keep the money made from selling these 10-cent bags. Prop 65 could change the way money from selling carry-out bags is used. Instead of keeping the money made from each 10-cent bag, stores would be required to put the money into a state account. This money would be used for many different environmental projects, including recycling and clean drinking water. Money would also go toward cleaning up beaches and improving parks. This measure could produce tens of millions of dollars for environmental programs. It is not clear what will happen until after the election. The effect on the state budget will depend on whether Prop 67 passes. If both propositions 65 and 67 pass, and 65 gets the most votes, then the money would go to the state account. Grocery stores should not get to keep the money made from selling bags. 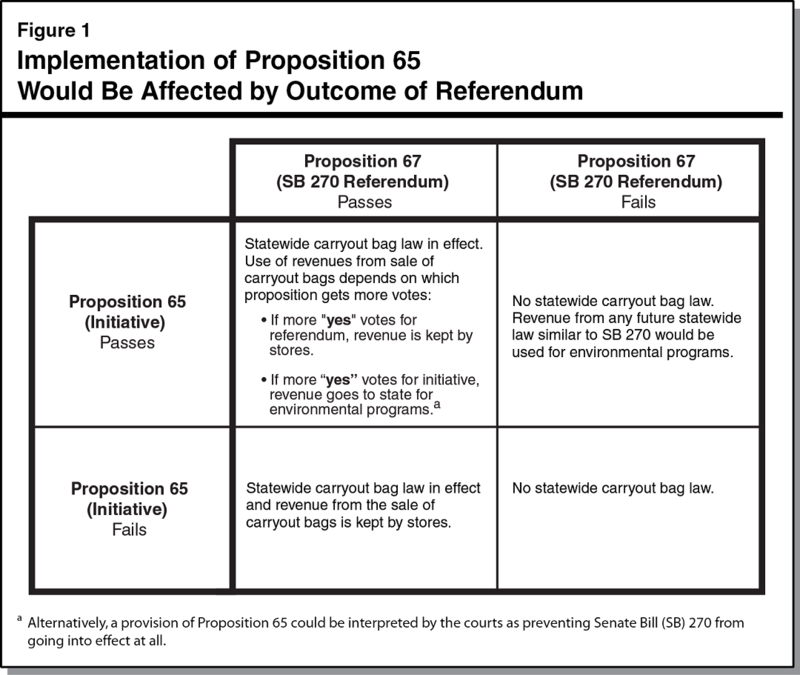 Prop 65 would make sure the money collected from selling bags goes to help the environment. Voters should support Prop 67 instead. The most important thing is getting rid of plastic bags. Prop 65 will not make very much money for the state because people will start bringing their own bags. If a statewide ban on single-use carry-out grocery bags is enacted, and stores are required to offer reusable bags for sale, should the money from the sale of those bags go to a special fund for environmental purposes? The Legislature passed a ban on single-use bags in 2014, which would have gone into effect on July 1, 2015; however, its implementation was suspended in February 2015 when a referendum qualified for the state ballot. The referendum appears elsewhere on this ballot as Proposition 67. The ban passed by the Legislature required that stores offer to sell reusable bags and charge at least 10 cents apiece for those bags (except to low-income customers). Stores would be allowed to keep that money, and to use it for certain specified purposes, such as covering the costs of providing carryout bags. Proposition 65 would redirect money collected by stores through the sale of reusable bags, whenever any state law bans free distribution of single-use bags and mandates the sale of any other kind of carry-out bag. Proposition 65 would create a new state fund, administered by the Wildlife Conservation Board, and require stores to deposit bag sale proceeds into that fund to support certain environmental projects. Proposition 65 would only be implemented if the Legislature’s bag ban is upheld by the voters’ approval of Proposition 67, or if a future, similar, bag ban is passed. Proposition 65 would apply statewide, including to the approximately 150 California cities and counties that have their own single-use carryout bag laws. If both Proposition 65 and 67 pass, the one with the most votes would prevail. Thus, if Proposition 67 receives the most votes, the 10-cent fee would be retained by the stores; if Proposition 65 receives the most votes, the 10-cent fee would go to the environmental fund. If voters uphold the bag ban by approving Proposition 67, and also pass Proposition 65 by more votes than Proposition 67, potential revenues for certain environmental programs could reach tens of millions of dollars annually. If voters uphold the bag ban by passing Proposition 67 and also pass Proposition 65 by fewer votes than Proposition 67, there would be minor fiscal effects. If voters reject the bag ban in Proposition 67, and pass Proposition 65, there would be no immediate fiscal effect. However, any future statewide bag ban could trigger the provisions of Proposition 65. Grocery stores should not be allowed to profit from the sale of reusable bags to consumers, who are prevented from getting free bags. A bag ban’s goal is environmentalism, so any money customers pay for reusable bags should go to environmental purposes, not to the stores. Grocery stores would not profit from the sale of reusable bags, which cost up to 15 cents apiece to produce. Proposition 65's only purpose is to distract from the real issue at hand, phasing out plastic bags, which is the real priority for the environment. Redirects money collected by grocery and certain other retail stores through sale of carryout bags, whenever any state law bans free distribution of a particular kind of carryout bag and mandates the sale of any other kind of carryout bag. Requires stores to deposit bag sale proceeds into a special fund administered by the Wildlife Conservation Board to support specified categories of environmental projects. Provides for Board to develop regulations implementing law. Potential state revenue of several tens of millions of dollars annually under certain circumstances. Revenue would be used to support certain environmental programs. Carryout Bag Usage. Stores typically provide their customers with bags to carry out the items they buy. One type of bag commonly provided is the “single-use plastic carryout bag,” which refers to a thin plastic bag used at checkout that is not intended for continued reuse. In contrast, “reusable plastic bags” are thicker and sturdier so that they can be reused many times. Many stores also provide single-use paper bags. Stores frequently provide single-use paper and plastic carryout bags to customers for free, and some stores offer reusable bags for sale. Each year, roughly 15 billion single-use plastic carryout bags are provided to customers in California (an average of about 400 bags per Californian). Many Local Governments Restrict Single-Use Carryout Bags. Many cities and counties in California have adopted local laws in recent years restricting or banning single-use carryout bags. These local laws have been implemented due to concerns about how the use of such bags can impact the environment. For example, plastic bags can contribute to litter and can end up in waterways. In addition, plastic bags can be difficult to recycle because they can get tangled in recycling machines. Most of these local laws ban single-use plastic carryout bags at grocery stores, convenience stores, pharmacies, and liquor stores. They also usually require the store to charge at least 10 cents for the sale of any carryout bag. Stores are allowed to keep the resulting revenue. As of June 2016, there were local carryout bag laws in about 150 cities and counties—covering about 40 percent of California’s population—mostly in areas within coastal counties. Statewide Carryout Bag Law. In 2014, the Legislature passed and the Governor signed a statewide carryout bag law, Senate Bill (SB) 270. Similar to many local laws, SB 270 prohibits most grocery stores, convenience stores, large pharmacies, and liquor stores in the state from providing single-use plastic carryout bags. It also requires a store to charge customers at least 10 cents for any carryout bag that it provides at checkout. Certain low-income customers would not have to pay the charge. Under SB 270, stores would retain the revenue from the sale of the bags. They could use the proceeds to cover the costs of providing carryout bags, complying with the measure, and educational efforts to encourage the use of reusable bags. These requirements would apply only to cities and counties that did not already have their own carryout bag laws as of the fall of 2014. Referendum on SB 270. Under the State Constitution, a new state law can be placed before voters as a referendum to determine whether the law can go into effect. A referendum on SB 270 qualified for this ballot (Proposition 67). If the referendum passes, SB 270 will go into effect. If it does not pass, SB 270 will be repealed. Redirects Carryout Bag Revenue to New State Environmental Fund. This measure specifies how revenue could be used that resulted from any state law that (1) prohibits giving certain carryout bags away for free and (2) requires a minimum charge for other types of carryout bags. Specifically, this measure requires that the resulting revenue be deposited in a new state fund—the Environmental Protection and Enhancement Fund—for various environmental purposes rather than be retained by stores. The fund would be used to support grants for programs and projects related to (1) drought mitigation; (2) recycling; (3) clean drinking water supplies; (4) state, regional, and local parks; (5) beach cleanup; (6) litter removal; and (7) wildlife habitat restoration. The measure allows a small portion of these funds to be used for grant administration and biennial audits of the programs receiving funds. Other Provisions. Additionally, the measure allows local governments to require that money collected from local carryout bag laws go to the new state fund rather than allowing that revenue to be kept by stores. It also includes a provision regarding the implementation of this measure and any other carryout bag measure on this ballot. This provision could be interpreted by the courts as preventing Proposition 67 (the referendum on SB 270) from going into effect. This provision would only have an effect if both measures pass and this measure (Proposition 65) gets more “yes” votes. However, this analysis assumes that in this situation the provisions of Proposition 67 not related to the use of revenues—such as the requirement to ban single-use plastic carryout bags and charge for other bags—would still be implemented. If the requirements of this measure (that there is a state law prohibiting giving certain carryout bags away for free and requiring a minimum charge for other bags) are met, then there would be increased state revenue for certain environmental programs. This revenue could reach several tens of millions of dollars annually. The actual amount of revenue could be higher or lower based on several factors, particularly future sales and prices of carryout bags. Proposition 67 (Referendum) Receives More Votes. In this situation, revenue collected by the stores would be kept by the stores and there would not be a fiscal impact on the state related to Proposition 65. Proposition 65 (Initiative) Receives More Votes. In this situation, any revenue collected by stores from the sale of carryout bags would be transferred to the new state fund, with the increased state revenue used to support certain environmental programs. In addition, if only this measure passes and Proposition 67 fails (which means there would not currently be a statewide law to which this measure would apply), there could still be a fiscal impact if a state carryout bag law was enacted in the future. Figure 1 shows how this measure would be implemented differently depending on different voter decisions.. If state law (1) prohibits giving customers certain carryout bags for free and (2) requires a charge for other types of carryout bags, the resulting revenue would be deposited in a new state fund to support certain environmental programs. If charges on carryout bags are required by a state law, that law could direct the use of the resulting revenue toward any purpose. Proposition 65 is needed to STOP grocery stores from keeping all the money collected from carryout bag taxes as profit instead of helping the environment. Grocery stores stand to gain up to $300 million in added profits each and every year unless you vote yes on Prop. 65. That money should be dedicated to the environment, not more profits for corporate grocery chains. Proposition 65 will STOP THE SWEETHEART DEAL WITH GROCERY STORES and dedicate bag fees to worthy environmental causes. Who in their right mind would let grocery stores keep $300 million in bag fees paid by hardworking California shoppers just trying to make ends meet? In a sweetheart deal put together by special interest lobbyists, the Legislature voted to let grocery stores keep bag fees as extra profit. The grocery stores will get $300 million richer while shoppers get $300 million poorer. The big grocery store chains and retailers gave big campaign contributions to legislators over the past seven years. And legislators rewarded them with $300 million in new profits—all on the backs of shoppers. Stop the sweetheart special interest deal . . . VOTE YES ON PROP. 65. You can do what the legislators should have done— dedicate these bag fees to real projects that protect the environment. Proposition 65 dedicates the bag fees to environmental projects like drought relief, beach clean-up and litter removal. It puts the California Wildlife Conservation Board in control of these funds, not grocery store executives, so Californians will benefit. PROTECT THE ENVIRONMENT. STOP THE SWEETHEART DEAL AND HIDDEN BAG TAX. VOTE YES ON PROP. 65. Prop. 65 promises a lot but—in reality—will deliver little for the environment. It was placed on the ballot by four out-of-state plastic bag companies who keep interfering with California’s efforts to reduce plastic pollution. 65 is without real significance, designed to distract from the issue at hand: phasing out plastic shopping bags. All 65 would do is direct funding from the sale of paper bags (an option under the plastic bag ban) to a new state fund. The money for this fund is a drop in the bucket and will shrink over time as people adjust to bringing reusable bags. The priority for California’s environment this election is to reduce harmful plastic pollution by voting Yes on Prop. 67. This will continue efforts to keep wasteful plastic shopping bags out of our parks, trees, neighborhoods and treasured open spaces. Prop. 65 is not worth your vote. Make your voice heard on the more important issues and uphold California’s vital plastic bag ban further down the ballot. The out-of-state plastic manufacturers behind Prop. 65 don’t care about protecting California’s environment. They want to confuse you. Don’t be fooled. Bags aren’t free; they cost your local grocer up to 15 cents each. The out-of-state plastic bag industry figures are bogus. The state’s nonpartisan analysis projects that total revenue from Prop. 65 is in the range of “zero” to, at best, $80 million. Remember: there will be “zero” funding for the environment from Prop. 65 unless voters approve Prop. 67 to phase out plastic bags. But the plastic manufacturers behind Prop. 65 are spending millions to persuade voters to oppose Prop. 67. Confused? That’s the plastic industry’s plan! If you care about protecting wildlife and standing up to the out-of-state plastic bag industry, Vote Yes on Prop. 67, not this measure. If you care about reducing plastic pollution, litter and waste, Vote Yes on Prop. 67, not this measure. If you care about reducing taxpayer costs for cleaning up plastic litter, Vote Yes on Prop. 67, not this measure. The opponents of Prop. 65 want to dismiss it as “of no real signiﬁcance”. YOU DECIDE: IS A $300 MILLION MONEY GRAB BY GROCERY STORES NOT SIGNIFICANT? Without Prop. 65, not one penny of the $300 million customers will be required to pay if California’s ban on plastic bags goes into effect will help the environment. All $300 million will go to grocery store proﬁts. THAT’S $300 MILLION EVERY YEAR! VOTE YES ON 65—STOP THE SWEETHEART GIVEAWAY TO GROCERS. In a sweetheart deal put together by special interest lobbyists, the Legislature voted to BAN plastic bags and REQUIRE grocery stores keep bag fees as proﬁt. Their “plastic bag ban” REQUIRES grocery stores to charge every consumer given a bag at check-out no less than 10 cents per bag. They could have banned plastic bags without a fee or dedicated fees to environmental projects. Instead, they made grocery stores $300 million richer and shoppers $300 million poorer every year. A BETTER WAY TO PROTECT THE ENVIRONMENT. You can do what the Legislature should have done—dedicate bag fees to projects that protect the environment. Prop. 65 dedicates bag fees to environmental projects like drought relief, beach clean-up and litter removal. It puts the California Wildlife Conservation Board in control of these funds, not grocery store executives. PROP. 65 WILL DEDICATE BAG FEES TO THE ENVIRONMENT. You probably thought the plastic bag debate was over: The Legislature passed a statewide ban in 2014, and before that dozens of local governments in California had already banned supermarkets from handing out plastic bags at the checkout counter. But the plastic bag industry is fighting for manufacturing jobs, and brought not one, but two, measures to California’s ballot this year. One is Proposition 67, which asks voters to approve or reject the statewide ban, which hasn’t yet taken effect. Proposition 65 is about money. There are currently some 150 local laws banning plastic bags, and they generally require stores to use these funds to pay for the cost of reusable bags and for educational programs encouraging bag reuse. Prop. 65 would redirect revenue from bag fees to a special fund administered by the Wildlife Conservation Board to support environmental projects. But most environmental groups who fought for the plastic bag ban, such as the Surfrider Foundation and Californians Against Waste, oppose Prop. 65. They say it’s a ploy to confuse voters so they simply vote “no” on both plastic bag measures, thus defeating the statewide ban passed by the Legislature. What happens to the bag fees ultimately depends on how voters decide both this measure and the statewide ban. If voters pass both measures, then whichever measure has more “yes” votes becomes the rule for how to spend the money. If voters reject the statewide ban and approve Prop. 65, then cities and counties with local bans can continue to use funds as currently set up or they can opt to direct the money to the new special environment fund. Search for more organizations for here. Search for officials for here. There may be discrepancies between Voter's Edge campaign finance data and other sources, such as the Secretary of State's Quick Guide to Propositions, due to differences in methodology. See How we get our data for more information.